Natural conditions in Tripura are ideal for diverse patterns of cultivation, for the cultivation of cereals, pulses and other food crops, of plantation crops, and of a rich range of agricultural and horticultural crops. Lands of Tripura can become major economic and ecological assets of the people of the State. The average annual growth rate of rice production between 1999-2000 and 2004-05 was 2.1 per cent, and yield growth was very low (0.4per cent). Even taking a longer time horizon, the growth performance in respect of rice and food grain has not been satisfactory (at around 1.5per cent per annum). The average rice yield in the State, 2.2 tonnes per hectare, is however a little above the all-India average (2 tonnes per hectare), with West and South Districts showing higher yields than North District and Dhalai. 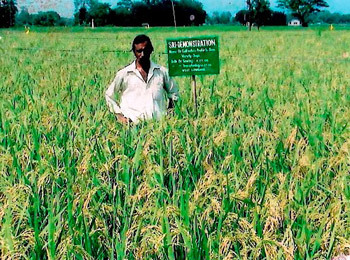 Over the years, Bengali speaking immigrants, including Partition refugees, have contributed to improvements in agriculture, particularly wet-rice cultivation. Agriculture in the State has the potential to develop. Past performance has been constrained not just by the terrain but by a lack of development of irrigation, limited use of modern inputs, and inadequate access to agricultural extension and markets.